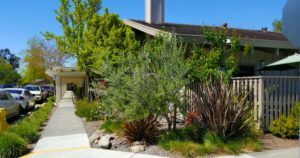 The California Landscape Contractor’s Association’s North Coast Chapter (CLCA) recognized Gardeners’ Guild for four awards at their annual awards ceremony in Santa Rosa. The Sustainable Award exemplifies Gardeners’ Guild’s reputation as a sustainable landscape pioneer with regard to water conservation and ecological practices. Its requirements were scrupulous: the contractor needed to show dedication to sustainable principles that include water/energy conservation, fossil fuel reduction, green waste recycling, Integrated Pest Management (IPM), reduction of chemicals and storm water runoff; use of organic products and conversion of high water use plants. Daniel Levy, Account Manager for Spring Lake Village, a passionate advocate for ecological practices, has managed the landscape for the last ten years. During that time, renovation work was phased in gradually with a single-minded purpose – to reduce the use of chemicals and synthetic products; save water and fossil fuel. The property, once dominated by large swaths of turfgrass, has been gradually converted to natives and other drought tolerant plant material. The recent renovation and installation work was a combination of irrigation upgrades, plant palette changes, grading and drainage work. Bioswales and rain gardens were installed to manage storm water. To build living soil and enhance biodiversity they sharply reduced the use of synthetics, replacing them with weed barriers and mulch to build soil, hold water and resist weeds.